A crown or ‘cap’ is used when a tooth is badly broken or heavily filled; the aim is to restore its appearance and strength. Our usual method for fitting a crown involves shaping the tooth under local anaesthetic and then taking an impression using a rubber-like material. We send the impression to a specialist laboratory along with the details of the shade to be used, and the technician makes the crown. 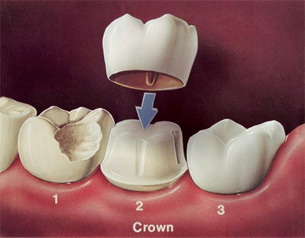 This normally takes a couple of weeks while the prepared tooth is protected with a temporary crown. Crowns can be made of a variety of different materials, such as porcelain or porcelain bonded to gold – we can chat about which crown would be best for you.